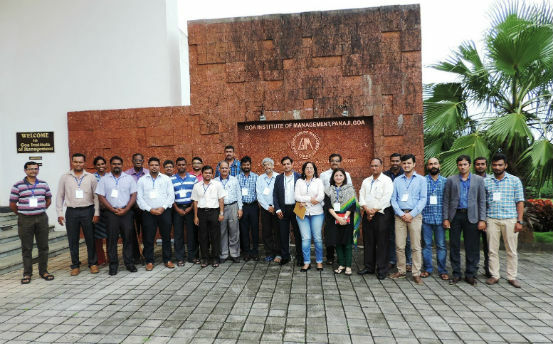 Panaji: Goa Institute of Management (GIM), the leading Goa based B-school’s Centre for Innovation recently brought together the local start-up community with its students to discuss and deliberate on innovation challenges and collaborate with the GIM faculty and experts. It may be pertinent to note that the state government recently released the Goa Startup Policy 2017. The flagship event ‘inDialogue’ is an attempt to offer a platform to the start-up community to connect, share their work and explore avenues for collaboration and mentorship. The day long summit saw entrepreneurs who have transformed innovative ideas into start-up ventures and academicians come together and acknowledged the importance of a co-evolutionary approach of academicians and de-novo firms in today’s times. The ‘inDialogue’ start-ups event identified the issues that start-ups are currently facing and areas in which academic and expert inputs would be critical contributors to further growth. The GIM team on its part had the opportunity to understand the vibrant start-up ecosystem that is evolving at a rapid pace in Goa and is poised to become a prominent axis of innovative practices. Each start-up presented its goals, strategies and process executions in their presentations, followed by informal discussions held in an open house. Faculty members specializing in a particular area of expertise guided some of the budding entrepreneurs with relevant inputs in the field. In the ensuing exchange, it emerged out that there was a dearth of such events and gatherings within Goa and platforms such as these were necessary to help the acceleration and sustainability of start-up firms in Goa explained Prof. Nitin Upadhyay, Chairperson and Head, Centre for Innovation at GIM. The event concluded with an intent to form a long-term association between the start-ups, academicians and practitioners within GIM to chart the road ahead. It was decided that the firms would maintain contact with GIM across the months to come and seek necessary mentorship from faculty to scale up their ventures. The Centre for Innovation plans to facilitate several such events and platforms in the coming year. In addition to the Chairperson Prof. Nitin Upadhyay, the Centre for Innovation has a high performance team which comprises of Prof. Nitasha Borah, Prof. Rohit Mutekar, Prof. Sarat Kumar Jena, Prof. Ranjit Kumar Dehury and Prof. Akshay Bhat. The Centre for Innovation is a growth and accelerator platform of Goa Institute of Management (GIM) where innovation challenges are explored with an aim to produce academic, and industry relevant practices and provide thought-leadership in design, development, analysis, management and execution of breakthrough ideas. The Centre of Innovation connects the faculty, students, market, society and a large network of scientist, entrepreneurs, start-ups, public sectors, private sectors and NGOs.